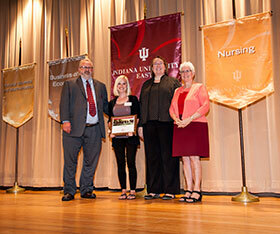 Indiana University East celebrated the accomplishments of its students during the annual Honors Convocation held April 28. School of Business and Economics Dean David Frantz, Interim Vice Chancellor for Academic Affairs Mary Blakefield and Chancellor Kathryn Cruz-Uribe present the Outstanding Student in Accounting award to Crystal Bitner. Chancellor’s Scholar Awards are campus-wide awards, presented to the highest achieving seniors, by academic school. • Jessica Baker, Richmond, Ind. • Sierra Bass, Brownsville, Ind. • Tony Breitenbach, Richmond, Ind. • Kylie Gardner, Portland, Ind. • Christopher Halberstadt, Cambridge City, Ind. • Tyler Johnson, Fountain City, Ind. • Carly Manis, Muncie, Ind. • Alexis McDavid, Portland, Ind. • Danielle Peckinpaugh, Cambridge City, Ind. • Adam Reisert, Richmond, Ind.